Dramatic cutbacks in legal aid since 2013 mean that most of us in England and Wales don’t have the means to take advice from a solicitor or be represented by a barrister if we have to go to court. If this is the case you are called a Litigant in Person (LIP). A court case can have life-changing results: the loss of our liberty (ie prison), the loss of the right to see our children, the loss of a roof over our heads, financial loss, social ostracisation following a conviction… The importance of ensuring that everybody plays on a level playing field is evident. However, if your opponent has enough money to hire a solicitor to advise him/her and a barrister to represent him/her, you will almost certainly find yourself on a very slippery, uneven slope of a playing field. If our judicial system does not allow you, as a LIP, fair play, it means that justice is reserved for those who can pay for it. With solicitors and barristers costing £150-£750 per hour, many of us can’t. Others would prefer to use their money elsewhere or don’t trust solicitors. Isn’t justice meant to be a fundamental right, whether you’re rich or poor? More and more of us are having to attend court without a lawyer. There are three things which can potentially ensure a level playing field. The first is good, sound, free advice. Thankfully voluntary bodies such as the PSU, RCJ Advice, LawWorks, Law for Life, Bar Pro Bono Units and the Access to Justice Foundation are all doing an admirable job to help the most vulnerable litigants, such as the disabled, the elderly, the unemployed. But these are mostly overwhelmed and often unable to offer help. The second is the attitude of the judiciary towards the LIP. In order to ensure a level playing field, it is essential that judges, solicitors and barristers are accommodating to LIPs. Thirdly, it is long past time that our archaic court system is updated: simplifying, demystifying and digitalising the process; so that almost everybody can file online, access their case and get real time help when necessary. Reform is apparently underway but let’s hope that the end result is tailored to the needs of the public, which it is to serve, and not just to the judiciary. The recent debate over whether hearings should be digitalised seems to have taken place between all kinds of legal experts, with apparently no feedback from the public. 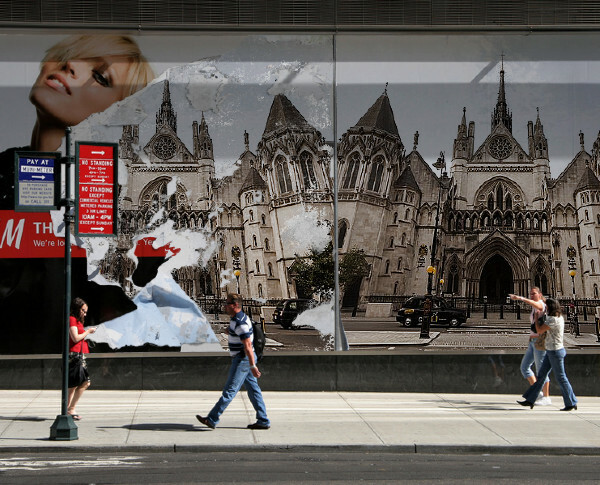 The crumbling state of the criminal courts was exposed by “The Secret Barrister”*. It is now our turn to expose the breakdown of justice in the Civil and Family courts. It’s not only because of the huge cuts in legal aid and in the Ministry of Justice, which lead to a court administration that can no longer cope. It is above all, the attitude of the judiciary towards the LIP. And it is the objective of this campaign to address this serious failure. After the implementation of the Government’s Legal Aid Reforms on 1 April 2013, there was a realisation that the judiciary would need to adjust to the serious rise in numbers of LIPs. It started in December 2012 after a discussion at the Judge’s council about the implication of the expected rise in the number of litigants in person. In particular, there is “A Handbook for Litigants in Person (LIPs)” written and edited by six circuit Judges. This is an incredibly clear, precise, step-by-step guide as to how to proceed with your claim or defence as a LIP. But the idea is not only for LIPs to help themselves through the myriad of Court Procedures and legal jargon but for the judges, solicitors and barristers to do the same. 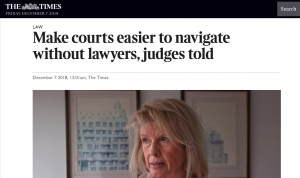 Hence the “Litigants in person: guidelines for lawyers”, (June 2015), which includes guidelines as to how solicitors and barristers should help the LIP “navigate the civil justice system as effectively as they can”. The sad truth is that these guides, whilst very worthy, are no more than guides. They are often ignored by the judiciary and there is no way of enforcing them. Unaware of this, LIPs are being lulled into a false sense of security: if you expect things to happen as described in these guides, you are likely to be extremely disappointed. In many instances, these guides can be very misleading and can cost you your case. As the Secret Barrister points out, breaches in Court Procedure, or the lack of its enforcement, are most often explained by overburdened courts and judges. And this undoubtedly extends to the lack of respect for the guidelines concerning LIPs in the civil and family courts, especially those regarding how the judiciary should help LIPs navigate the civil justice system. But what is disturbing is that there is a growing number of LIPS who have had experiences which have made them lose faith in the courts: solicitors and barristers who have made errors (intentionally or unintentionally), judges who don’t appear to listen, act fairly, or explain what’s going on… And yet they have no redress. Clearly, if faith is to be maintained in our system of justice, which is reputed to be one of the best in the world, something has to be done. Finding yourself playing on a severely un-level playing field, because the judiciary, to your surprise, has refused to help you navigate the system, is bad enough. Even worse, some solicitors and barristers are actually taking advantage of the system, not just ignoring guidelines, but even breaking Court Procedure, for which you, as a LIP, can rarely obtain redress. Few LIPs dare to make an appeal, since not only does it cost money, but there is always the chance that if you lose you will end up paying your opponent’s costs, including their colossal solicitor’s and barrister’s fees. So if the courts and judges don’t enforce the Court Procedures, or the Guidelines on “good practice” when dealing with LIPs, what can you do? The only other option is the SRA (Solicitor’s Regulatory Authority) or the BSB (Bar Standard’s Board), which to all appearances will protect you as a LIP from solicitors or barristers who breach their respective codes. In 2016 the SRA received close to 20,000 complaints and took serious action against just 27 solicitors. The BSB opened 75 complaints about the conduct of barristers, of which the 34 barristers who had disciplinary findings made against them, six were disbarred and a further eight were suspended. In Barton v Wright Hassall LLP, Mr Barton attempted to serve a claim form on the defendant’s solicitors. An obscure and seemingly archaic rule states that email is not an acceptable means of communication, unless the receiver has given prior consent to be informed this way. So the court ruled that the service of papers was not compliant with the Civil Procedure Rules (CPR). Does this rule in any way serve the interests of justice?. The Supreme Court confirms no leniency for a litigant in person who failed to follow the rules on service of a claim form. Mr Barton’s claim was therefore struck out. *”The Secret Barrister” is a best-selling book revealing the inner workings of the criminal courts. It is an extraordinary eye-opener, showing the damage done to justice due to the drastic cuts in legal aid and expenditure at the Ministry of Justice. The author, a barrister who continues to practice, has succeeded in remaining anonymous. It is a “must read” for everybody who believes in justice for all. It has been recommended as essential reading for every MP. In 2017 Fiona Scott Lazareff created a campaign: “MissingOverseas” with the objective of getting the FCO (Foreign Commonwealth Office) to change the way they react when a UK national disappears or dies overseas. It followed the appalling way the FCO acted when her son disappeared in Moscow in December 2016 and was later found dead. After contacting her MP, a debate took place in the House of Commons on the subject and an APPG (All Party Parliamentary Group) was created by Hannah Bardwell, MP. The FCO has now adopted the various suggestions, which Scott Lazareff made in correspondence with Harriet Baldwin, Minister of the Foreign and Commonwealth Office (FCO). These include “treating all people reported as missing as vulnerable for the first 24 hours after a report has been made: staff are now clearly advised never to assume the missing person will be found and to treat the disappearance as a reality from the beginning, urging local authorities to do the same”. Finally but most importantly, they took forward Scott Lazareff’s suggestion on IMEI numbers. They have included this in their Travel Advice here – https://www.gov.uk/guidance/foreign-travel-checklist – and are looking at ways of promoting this further. The APPG met on several occasions and recorded the experiences of over 50 people who had suffered as a result of the FCO’s negligence and a detailed report together with further recommendations will be published by year end. Having campaigned successfully for change at the FCO, Scott Lazareff has now turned her attention to the plight of LIPs (Litigants In Person) and launched the campaign “Right2Justice”. This is the result of her recent “terrifying” experience of litigating in person. “Back In 2001, I had a very reassuring experience of litigating in person, and so when I had a similar dispute with a firm of solicitors in 2017 about their fees, I saw no need to use a lawyer. “Sadly my recent experience has been quite different. Having read “A Handbook for Litigants in Person (LiPs), written and edited by six circuit judges, I was shocked to see how different the content of this guide is to reality. More recently in February 2018, Lady Justice Rafferty DBE, chair of the Judicial College, the organisation through which the and the Senior President of Tribunals deliver training material to the judiciary of England and Wales) published the Equal Treatment Bench Book, stating that the aim “is to ensure people leave court ‘conscious of having appeared before a fair-minded tribunal’”. The Book provides detailed guidance on a wide range of social issues, outlining the ways in which the representatives of different groups can be disadvantaged and experience prejudice, including Muslims, Jewish people, the physically and mentally disabled, transgender individuals and black and minority ethnic (BAME) people. But the first chapter is devoted in its entirety to “Litigants in Person and Lay Representatives” (McKenzie Friends). “Once again the guidelines are terribly misleading and in my case bear almost no resemblance to reality” says Scott Lazareff. The point is why do these publications exist when they are so far from reality? Are they just wishful thinking? Either way Scott Lazareff feels that LIPs need to be warned how misleading they are, before investing time and money, not to mention undergoing inordinate amounts of stress, as a Litigant In Person. In his reply the judge in question confirmed Scott Lazareff’s worst fears: that the problems she has faced are, in fact, widespread. Over the past year, Scott Lazareff has come across a dozen or so LIPs who faced the same kind of problems as she has (see testimonials section). The real problem is, if there is an effective redress, nobody has yet found it. Requesting a stay on an order, which seems unjust and is made without a hearing, is costly and expensive, as are appeals, especially when there is always a chance, (however slim), that you will lose, and end up paying the other side’s solicitor’s and barrister’s costs. Asking a judge to deal with a breach of Court procedures (even when the opposition, a firm of solicitors, admitted in the same hearing to the breach), has not worked for Scott Lazareff. Asking the court to put a letter in front of the judge has not worked either. A letter addressed to the Ministry of Justice has produced no reply. Whilst Scott Lazareff is waiting for the outcome of her complaints to the SRA; she suspects that the result, in spite of the five different breaches of SRA code of conduct made by the firm of solicitors, which she is up against, will be no more than a warning. This means that in order to realise their objectives, rogue solicitors and barristers can take the risk of ignoring guidelines and rules, knowing full well that they will not get effectively punished. They have lost all confidence in the system, exactly what their opponents are hoping for. I hope that my campaign will ignite a passionate debate about the lack of respect and enforcement of guidelines concerning LIPs and that this will result in a workable and lasting solution, allowing everybody access to justice whether they be rich or poor. But in the meantime, because it is not constructive to simply complain, I have put a list of suggested solutions together. LIPs should be known as the “The Public” and treated as the norm rather than the exception. Court procedures should be adapted to them rather than vice versa. People who are represented should be known as “The Represented”. The court’s administrative system should be updated and made user- friendly for “The Public”, as has been successfully done with HMRC and Companies House. There is a clear-cut need to digitalise most of the procedures, so that files can be accessed online (with the correct credentials). Clearly named and easy to fill documents should be submitted online. Email alerts should be sent to remind litigants of deadlines etc. The current system (including vocabulary) is archaic and alien to the public. The various guidelines should be incorporated into single code of conduct (or better still law), which is easily and immediately enforceable with serious penalties if broken. The judiciary (judges, solicitors and barristers) should attend a course of perhaps a week initially, with an update of a day, annually, to remind them of how they have to deal with “The Public”. When a member of “The Public” appears at a hearing, a check-list should be read out at the start to remind the judiciary of their duty to LIPs. Every pilot, however experienced, is bound by FA regulations to go through a pre take-off checklist to ensure that nothing is overlooked. Spot checks on hearings regarding “The Public” should be made by appropriate people from the Ministry of Justice. The way the SRA and the BSB deal with complaints should be investigated, to decide whether they should continue to be self-regulated. The gender imbalance needs to be addressed with the objective of having, over time, 50% of the judges female. “I have long argued that litigants in person deserve a much better deal from the Courts and Tribunals system. Court staff should have the power to advise them on the evidence they need to present their cases; many judges need to listen far more carefully to the points litigants are trying to make, even when they are difficult to understand; and opposing lawyers need to exercise more restraint, to avoid seeming to bully litigants in person. With the decimation of legal aid, the hardships of litigating in person need addressing urgently. Lord Marks of Henley-on Thames QC, Liberal Democrats, spokesperson for Justice. "I did not receive wrong doing from the judges or the courts as an LIP, but I was treated appallingly by the solicitors and the barristers. It was not until a one day oral permission to appeal hearing from the judgement of Arnold J, granted by Patten LJ, and a two day trial in Court of Appeal, comprised of Sir Terrence Efferton MR, Lady Justice Macur and Ryder LJ, that I was treated with respect and able to defend myself and children against lawyers suing me for fees and I was allowed to take my loss and damages counterclaim to trial. I later won another appeal for my costs incurred as a LIP when the family lawyers served me with a statutory demand during the Appeal process. "I spent 18 months going through the family courts at Norwich mostly as a litigant in person as my legal bills went over £23000 and the solicitors were proving to be inept at presenting my case or piles of evidence which I found negligent. I cannot put into words the suffering that has been caused to me and my family because of maladministration, professional Negligence and the inability to access justice through the courts. I am very grateful to have met so many campaigners now looking in to this and I hope together we will provide the knowledge and experience to reform the courts and see access to justice ‘for all’." "Jeremy Levison, barrister and founder of the Solicitors' Family Law Association, abducted my two young children whilst co-habiting with my wife (his client). She had declined custody of her children, but Levison advised her to request custody of the children in order to get the house and the money. He then instructed 4 ‘cronies' as his ‘proxy’ lawyers (paid by him) to act against me, causing me maximum aggravation, costs and hardship with the ultimate liquidation of my business. The evening before judgement of the lengthy custody case, Levison attended a drinks party with the judge, to whom Levison had given perjured evidence, in which he claimed that 'he had nothing to do with the case’." The information contained in these testimonials has been obtained by Right2Justice from sources believed to be reliable. However, neither Right2Justice nor its authors guarantees the accuracy or completeness of any information published herein and neither Right2Justice nor its authors shall be responsible for any errors, omissions, or claims for damages, including exemplary damages, arising out of use, inability to use, or with regard to the accuracy or sufficiency of the information contained in Right2Justice.